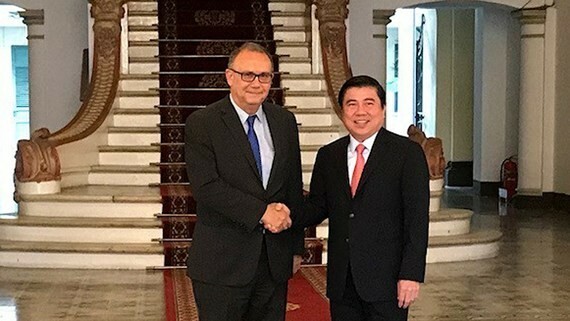 Chairman of the People’s Committee of Ho Chi Minh City Nguyen Thanh Phong on May 3 held a reception for Ambassador of Peru to Vietnam, Augusto Morelli. The city’s leader hoped Ambassador of Peru will be the bridge of friendship and cooperation between the two countries, including Ho Chi Minh City. He also wished that the cooperation and relation between HCMC and Peru’s localities will see a new step development. The municipal authorities affirmed to create advantages for Peruvian businesses, especially in the tourism sector. Ambassador of Peru to Vietnam, Augusto Morelli expressed his impression on the strong development of Vietnam, particularly HCMC. He emphasized that both countries have commonalities in culture and cooperation potentials after taking part in Asia-Pacific Economic Cooperation (APEC), Comprehensive and Progressive Agreement for Trans-Pacific Partnership (CPTPP). He proposed to establish Consulate General of Peru in Ho Chi Minh City in the upcoming time.